For everyone that has established some goals, I would like you to take a moment and assess how you are doing. Are you achieving them or are you exceeding them? If you are having trouble reaching them, then please let me know and feel free to ask questions. I would be happy to give some advice. This week the Fed increased interest rates. So it would help if you evaluated the effects of increased interest rates on any debt that you may have and how this could influence your financial future. It would help if you had a team of advisors to achieve your goals. These could include people who are accountants, lawyers, and business associates. Please do not expect that you can get to the finish line entirely on your own. Take advantage of expert advice. Please feel free to ask any questions that might help you to achieve your goals. Let’s all finish our 2018 plans with a blast! I want to congratulate everyone that is actively achieving their goals by moving to the right side of the quadrant as quickly as possible. Why it’s essential to have “S.M.A.R.T” goals. It would be better if you had a team of advisors to achieve your goals. It's time to assess how your tax bill will look at the end of the year. Be sure to ask questions of your advisors. 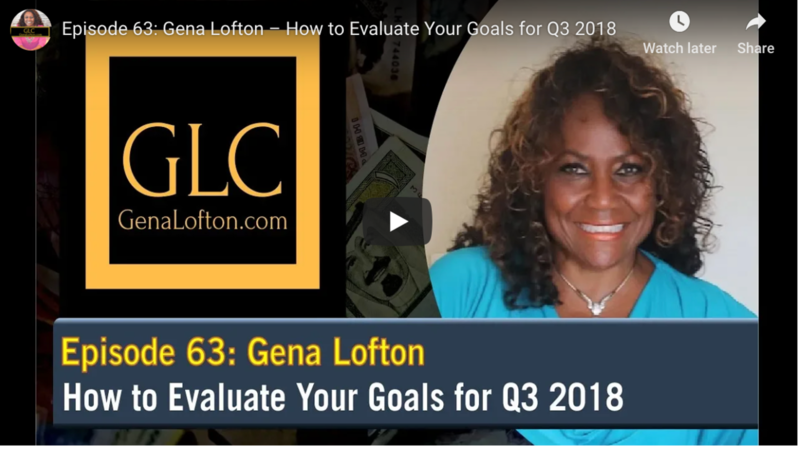 Gena Lofton is an Investor, Entrepreneur, Author, and Speaker. She is the host of the show “The Gena Lofton Show” which helps people to live a full life which begins with achieving financial freedom. She created a proprietary methodology, The Financial Freedom Formula F3 which is a step by step system which enables anyone to replace their higher taxed income with assets which generate tax-efficient passive income by using debt and reducing one’s taxes. Thousands have successfully used the formula to achieve financial freedom and it is the same formula which Gena used to acquire over 4,000 apartment units, a Hilton resort, assisted living facilities, oil and gas ventures, junior mining, technology, and telecommunication (e.g. AT&T) assets. Gena’s corporate career is extensive having transformed many Fortune 1000 companies while at Ernst & Young Management Consulting until the sale to Cap Gemini in 2002 for $11 billion. She spent nearly a decade as part of the management team of DIRECTV, which led to the sale to AT&T for $48.5 billion in 2015. She is the author of Escape the Madness, The, 10 Steps to Get Out of the Rat Race. She has never married and resides in Los Angeles, California.